I have a fun card to share today. I have a friend that just recently took a trip with her family to Hawaii. When I saw this stamp, I knew it would make the perfect card for her. I used two different stamp sets for this card, one by Stamping Bella and the other from My Favorite Things. They go great together! I stamped Hula Chick and then masked them off before I stamped the trees. I colored them using my Copic markers. I stamped on Hula Chick on a separate piece of card stock and then fussy cut her out. I added a Action Wobbler to the back so she can really do the Hula! I added some Glossy Accents to the coconuts, beaks, and hair pieces. After coloring the sand, I took some Copic colorless solution and an piece of an old towel to add some texture to the sand. I mounted the scene on some aqua card stock and then to the front of my card. I used the greeting from the Hula Chick stamp set in Versafine Black Onyx Ink and heat embossed it with clear embossing powder. The perfect greeting for this card. 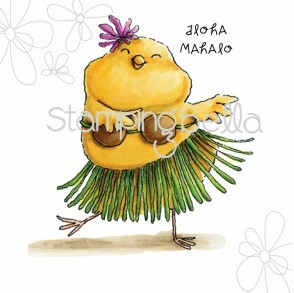 I hope you enjoy Hula Chicks!